Rochford Winery is a well-known winery in the Yarra Valley selling a range of red wine, white wine and sparkling varieties. 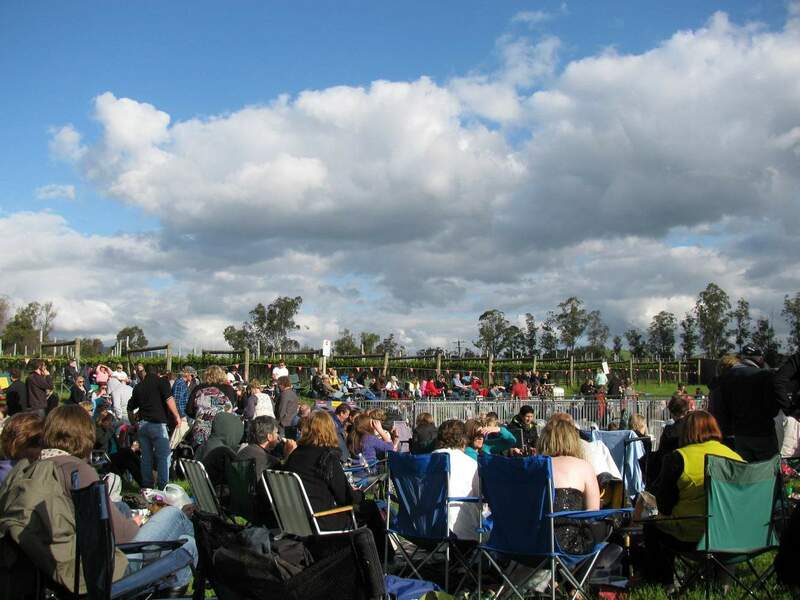 But Rochford Winery is probably best known as the host for the “A Day on the Green” outdoor concerts that are held during the spring and summer months on their beautiful lawn amongst the vineyards. 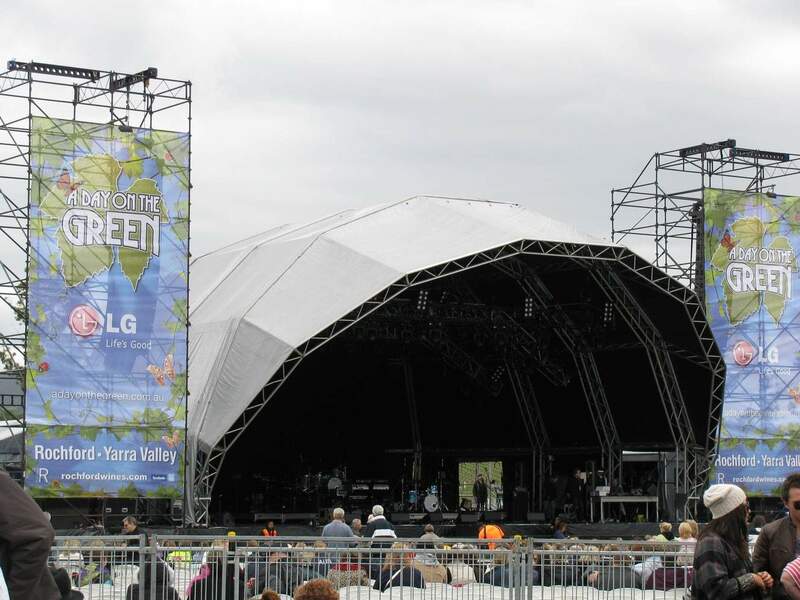 A real highlight of the Victorian Summer calendar, A Day on the Green brings a stunning array of both local and international entertainers to its stage for a huge outdoor concert. Past headliners have included Mariah Carey, Brian Adams, Tom Jones, Alicia Keys, John Legend, Elton John, Fleetwood Mac, Leonard Cohen, Blondie and the Pretenders. Most shows have three pre-show musical acts before the main artist, with the shows lasting for around 5 hours. 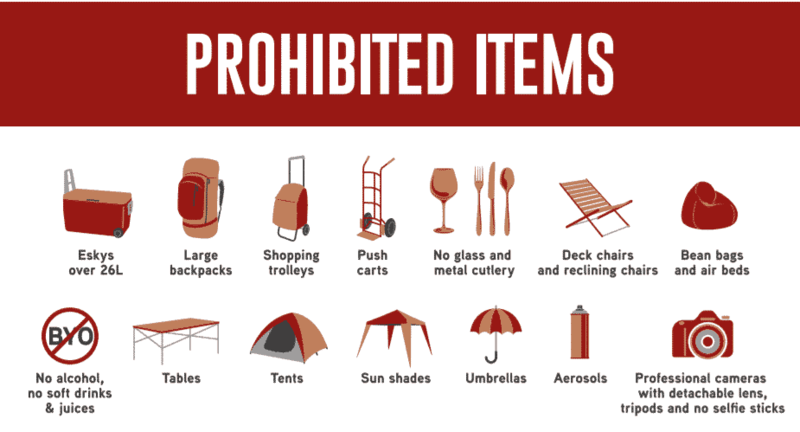 The concerts are held as a ‘festival’ type atmosphere where patrons bring a picnic and chairs and make themselves comfortable on the expansive lawns and settle in for a massive night of music. Food and alcohol can be purchased from the winery with a large number of food trucks and Rochford Winery wines and local beers available for purchase. 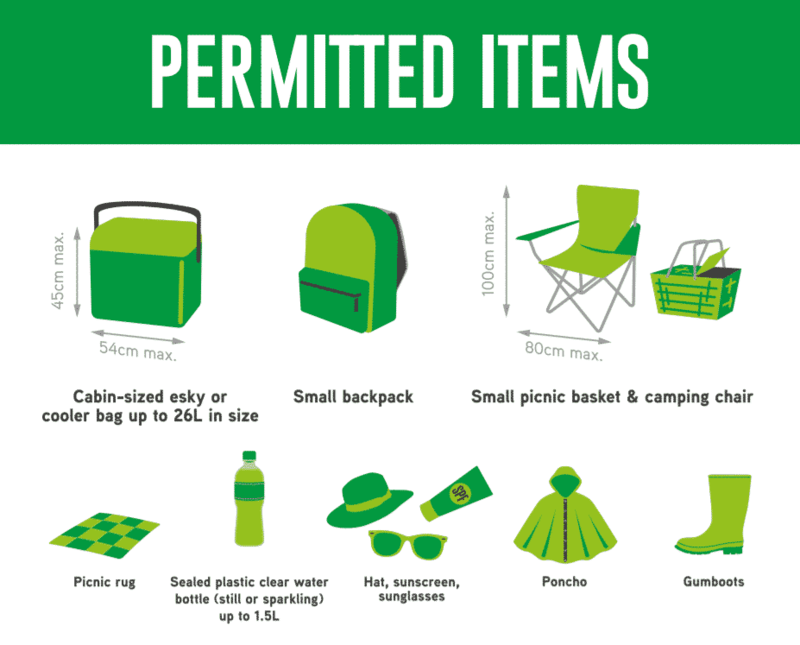 Most patrons bring picnic food and settle in for a long afternoon in the warm sun and watch the sun go down before the main act. Tickets should be purchased in advance, as most big-name artists sell out well before the event date. Check current programs for upcoming artists. 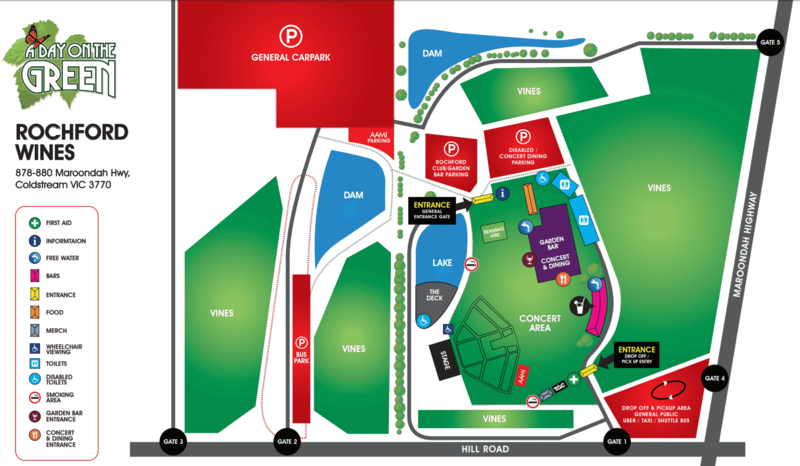 Most people coming to the Rochford Winery Concerts stay overnight, but make sure you book your accommodation early as thousands of people come to the Yarra Valley for these concerts and accommodation books out quickly. Click the link below to find the best accommodation deals. Elton John tickets at Rochford Winery range between AU $128.31 – AU $387.26. Get in early, tickets go on sale to the General Public from Monday 14th August at 10am. 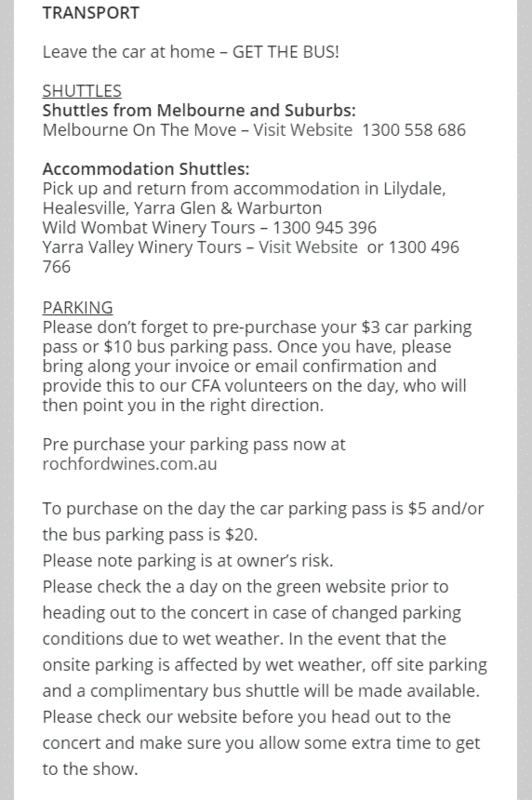 Hi, just need to know if you can you pay for parking when you get to rochford winery for a day on the green ? In previous events, there has not been a charge for parking at Rochford Winery. Therefore I believe that the upcoming concert this weekend should also have free parking.